I'm no mapper so I can't provide better advice, but there are somethings that I would like point out. First, like Tech said, the fountain really looks out of place. There's nothing wrong in wanting to have a fountain, but it's right in the midle of the path. 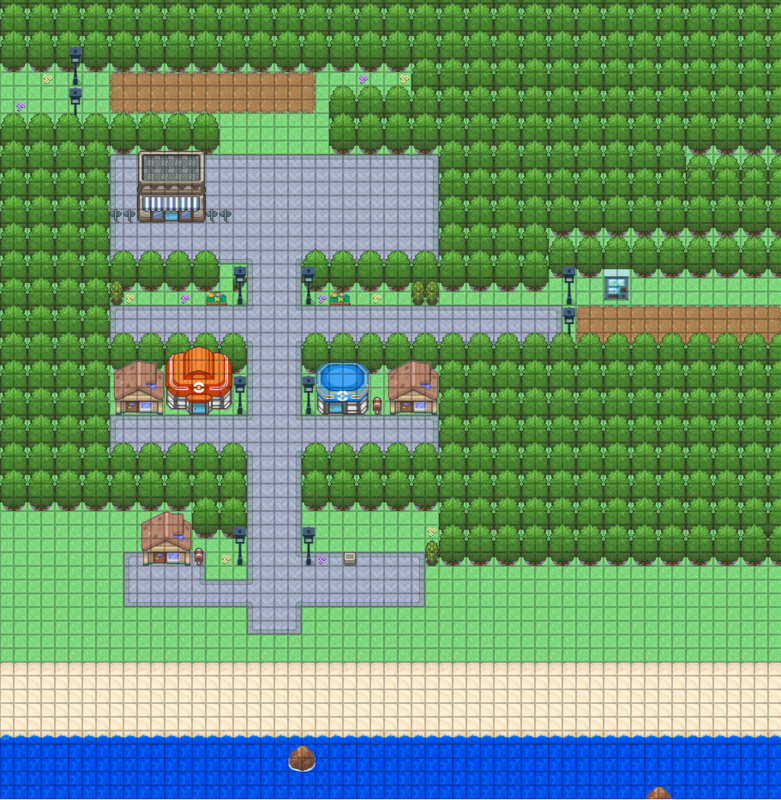 It looks much better if you make the lower part of town bigger and than make the path at least around the fountain. Second, your waterfall will droll everyone in the city, it's just too big for the river to handle. 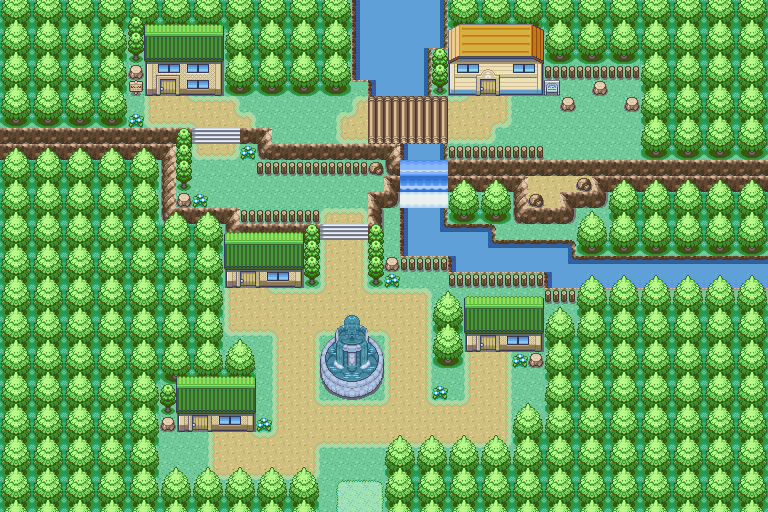 For river/waterfall reference, look at the Hoenn route 119. Notice how the river start at the top? That is something to pay attention too. The way you placed your river is unnatural, unless there are cities out there that are literally at the beginning of a river, which I don't know of. Thank you both for your comments! Anyway I made it like this now, is it any better? Also, yeah the waterfall/river thing is not finished. Ooh, that center looks much improved! Really gives it a town square feeling! Your town looks super organised and tidy which is a fine theme. But you need to go in game and see if it looks boring at some places. You might consider removing some useless space at the edges of your map or adding some more decorations. Similarly to what you did between the 2 stairs. Those bushes and flowers look super nice and done correctly it can still give off that clean feel while having more going on. The upper half has the elevation (mountain tiles) plus river to make the map look more interesting while you'll need to work more with flowers/bushes/paths etc on the lower half. Maybe also vary path widths. Right now every path has a width of 3. Try making the main roads 3 and the smaller ones to some houses 2 tiles wide. I think that would go a long way for the paths to the lower houses. Getting to the top right house looks like a real pain ... maybe add stairs directly up and let the path split from there. It may look better from the big perspective this way but going all the way to the left then to the right is an annoying long path. The house seems special ... so if it is one that the player needs/wants to go to several times this is extremely important. Don't get the criticism above wrong. Your map looks nice ... those are just some points that could be improved on imo. Hello! I’ve got some maps for an upcoming game, but I feel like somethings are missing. Thanks in advance! The [img] tag is pretty nice. ah, my apologies. thank you very much! It’s been a while for me. This map doesn't seem finished. On the right place of the bike shop there is something missing. If the space doesn't have any purpose I'd consider just removing it. The same goes for the continuation on the left of the path to the route to the right. There is just nothing there. Might as well remove it and make the village more compact. I think too much geometry is boring anyways. The lowest path to the right leads nowhere so I'd consider placing a building or a bench or whatever there to justify it or again getting rid of the useles space above the path. The beach area in general is too open. There are several screens with no obstacle or interesting things at all. Try altering the tree/beach/water line. Also make the paths down there narrower and place some decoration and obstacles like flowers/trees/rocks/etc. This route looks pretty neat. I'd consider moving the right exit to the forest to the top or make the forst exit tile a tad more noticable because with the lamps and mud puddle I thought the entrance was at the top first. Maybe also try to vary the lakes to be not just rectangles and have like an item on the other side that can be obtained through surf. Maybe also apply that to the mud paths. Try to make them even less like a rectangle. Also there's a mapping mistake beneath the left of the 2 lowest lamps there is grass isntead of mud. Those are only minor complaints ... I really like the usage of the flowers/trunks/bushes/lamps/tall grass/muddy path/lakes to make the route look alive and nature like. 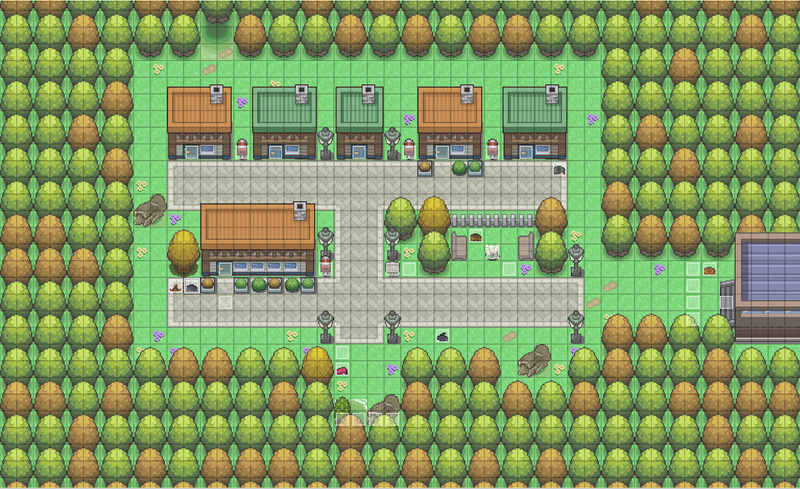 I think this Town will look super good if you just were to vary that 2 tile frame between the city and the trees. Most of the time there shouldn't be that blank stripe and when there is there should be something interesting like the thingy at the bottom and the forst entrance at the top. Maybe conider making it acessable through a garden only. That frame just expands the map by a lot without adding much. I'd consider moving the passage house on the right a few tiles to the left. Just so the player doesn't have to walk as far. Everything within that 2 tile frame looks great imo. Ooh, it's looking really nice! I would say that, whether or not you put in those lanterns/lampposts, I think the yellow plants should be taken out-they kind of clash with the color scheme. Hello, guys. 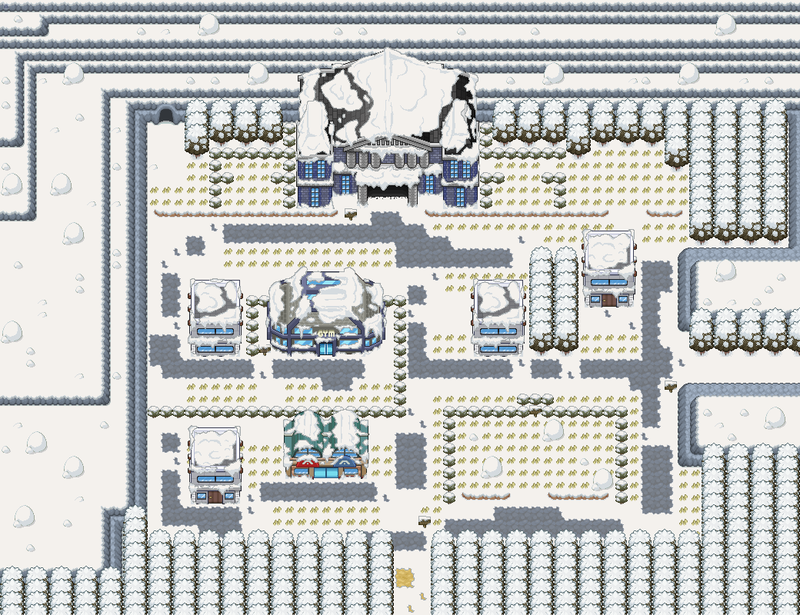 So I made a few maps. Wanted to know if there is any issues. Just share your reviews and thoughts on them. Overall, I like the pathways and arrangements, but in the first map those loooooong straight cliff faces are a little painful. Some variation would be nice. These aren't bad! The long flat cliff face in the first one also jumped out at me, though - although you could probably explain them away by saying they were cut out like that to make space for the buildings, if you put a little unevenness on the rest of it. Also I don't remember offhand what the tile dimensions of the game screen are, but that many three-wide roads might take up a lot of space. For the most part, I like the second two a lot - the layout of the trees look like they just grew up like that and, for lack of better words, "organic." The way the colors of the trees are completely separated and the places where the little trees form a border around the bigger trees is kinda jarring though - irl plants spring up wherever they can, and they don't check to see if someone else has already staked a claim to the area first, or if there's a dress code that they have to follow. In my opinion the trees should all be the same type, whichever type that is. If you're going for a more realistic look usually similar trees grow in the same area. It looks kind of out of place to see 4 very different looking trees nearby each other but segregated in clusters. 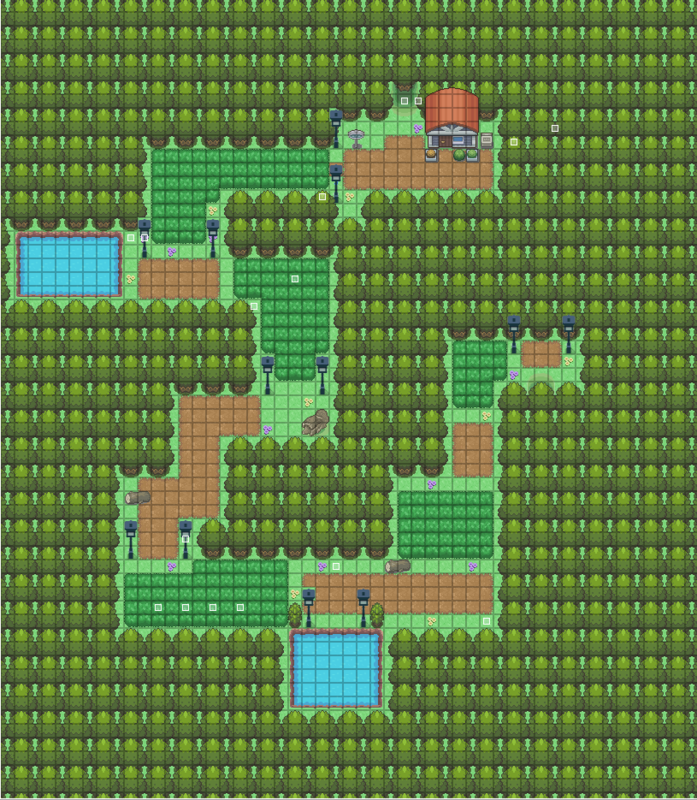 (Referring to Route 501 now) maybe you want to split the map into two types of trees so that it looks neater. Or maybe put every colour of tree in any area that you want trees to be in instead of only putting the same colour of tree together; blend the trees together. The waterfall looks very odd. It's so wide but there doesn't seem to be a source of water. Maybe create a river that goes throughout the route or enters the route from the side? Where the waterfall filters into is way too small. I recommend having the pool of water that it falls into be one tile deep. If a waterfall is filtering into a lake that's a different story but that isn't a lake. Or just remove the waterfall. Why so many different types of trees? I like the maps tho! its just i dont understand the trees.